Remember the big 24 in 24 Krylon event that I attended a couple months back? Well, after that wonderful-madness ended, I couldn't rest for long, because only a few weeks later a big ol' Krylon Mystery Box showed up on my doorstep. 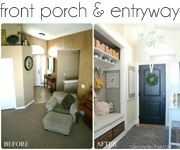 What's your initial reaction when you read these below words, paired with the phrase "Make something, pretty, classy and useful for your home"? Pipe cleaners, googly eyes, Popsicle sticks and foam stickers. I don't know about you, but I literally start to sweat, and panic sets in. I have known that this "mystery box" project was coming up for a couple of months now, but (like a true mystery) had no idea what to expect inside. The above mentioned items were on my worst case scenario list, and luckily, I didn't have to deal with any of them. LOL. Our requirements were to use at least 5 of the items in the box to complete a project, and so naturally I quickly ruled out the red spray paint, because I knew it probably wouldn't go well with my home's decor, and (after a hearty attempt of trying to make it work) also ditched the puzzle. In the end, this is what I came up with, and here's how I pulled it all together! My first concern/priority was that funky shoe rack. I pondered long and hard over that crazy piece, and in the end decided that using PART of it, basically counted as "using it"... right? So I tossed the plastic ends and had Cason cut the metal rods into even pieces for me with a jigsaw. 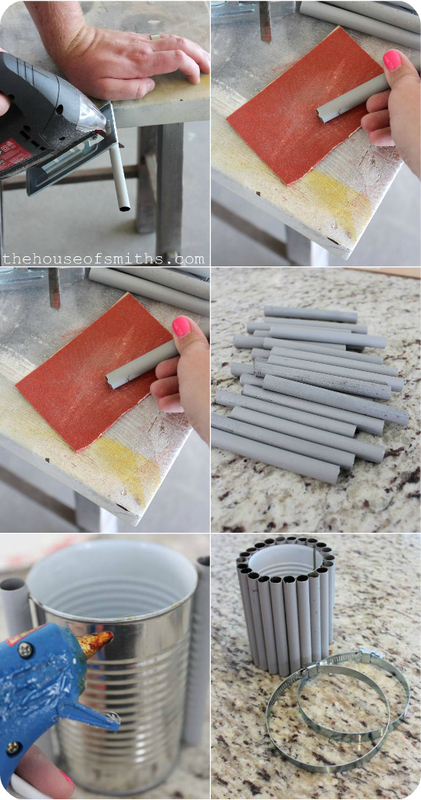 Once I sanded down the rough edges a bit, I hot glued them onto an empty soup can so they would stand up straight. Since the exposed edges were still a bit sharp I went wandering around the hardware store for ideas on how to finish the top and bottom. I stumbled on these stainless steel dryer duct adjustable clamps and knew they'd be perfect. 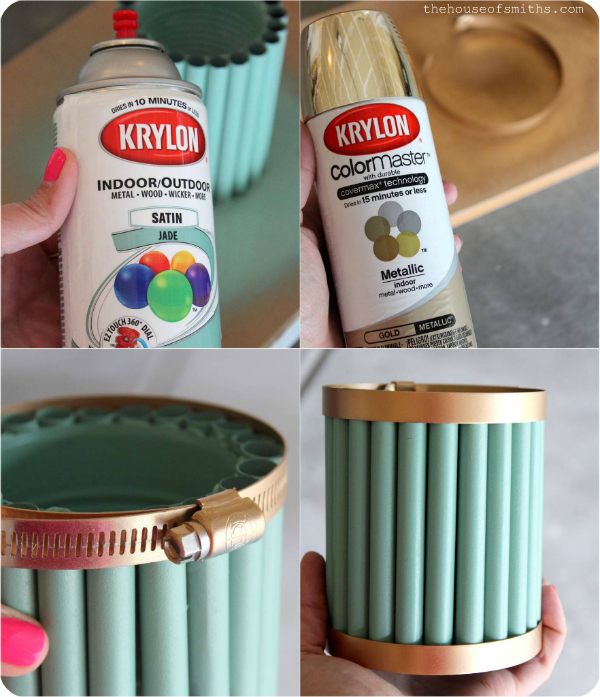 I used Krylon's Jade color in a satin finish for the body of the pencil holder and the Gold Metallic for the clamps. After everything was dry I simply tightened the clamps around the top and bottom of the shoe racks metal rods and I was done! I could have just thrown the pencils into my new holder, but I decided with a little white spray paint and some glitter tape, these pencils could be kicked up a notch too. I mean who doesn't like writing with a fun pencil when doing their homework? 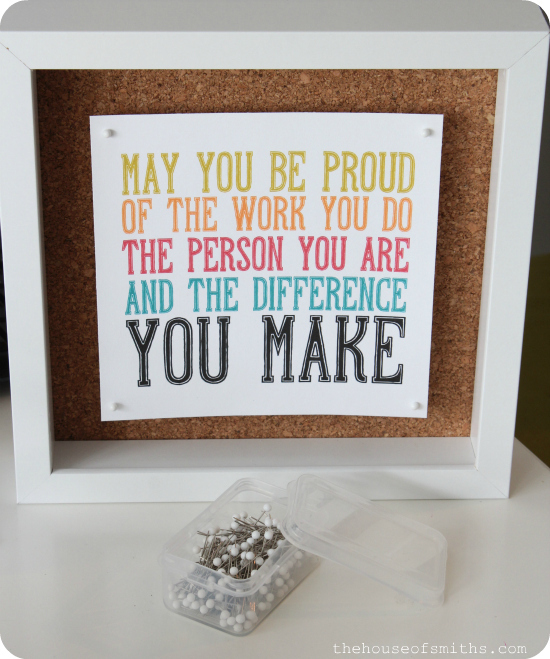 I wanted to include a motivational saying in this little space somewhere, so I cut the cork board to fit a shadow box frame from Ikea and designed this printable to go inside. click on this image below, save it to your computer and print it out for yourself! Instead of just applying it straight to the cork, I suspended the cardstock with a few sewing pins, which gave it a cooler, three-dimensional look. I decided that the containers were great as is, but would be more fun with chalkboard tops, so I sprayed them with three good coats of the Krylon's chalkboard spray paint and then filled and labeled them. To finish off our homework station I added a few extra things that I knew we were going to need this year. Crayons, colored pencils, erasers, glue, stapler, staple remover, pencil sharpener, scissors, tape and two blank notebooks for the twins when working on spelling words. 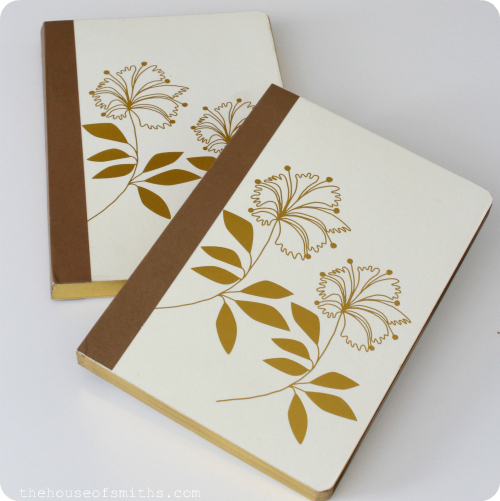 We learned that our kids go through a LOT of paper when spelling word practice time comes around, so I thought this year we'd try utilizing a couple of notebooks I snagged on clearance at Target, to use everyday for practicing instead of wasting endless sheets of computer paper. I was a bit worried at first when Cason and I decided that a homework station was a good idea for using these mystery box products, because we really didn't have any extra room in our home for something extravagant or over-the-top... but then I got thinking about how MOST of us don't have much spare space... and that's why I was determined to fit everything onto this small, beautiful tray! Almost everyone has room for something about this size, right? 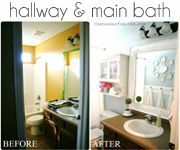 You know me, I'm a firm believer that no matter what size your space, you can have beautifully designed, functional organization in your home. Sometimes it takes getting a little creative, but the payoff in the end is definitely worth it. It's been about 5 days since our homework station has been done, and honestly, it's stayed pretty nice so far! I think that even just designating this little table downstairs in our basement to being "the homework station" has been good for me AND my kids. It's right outside of my office, so I can help them when they need it, and it keeps all of the homework mess out of the kitchen, where it usually ended up last year. 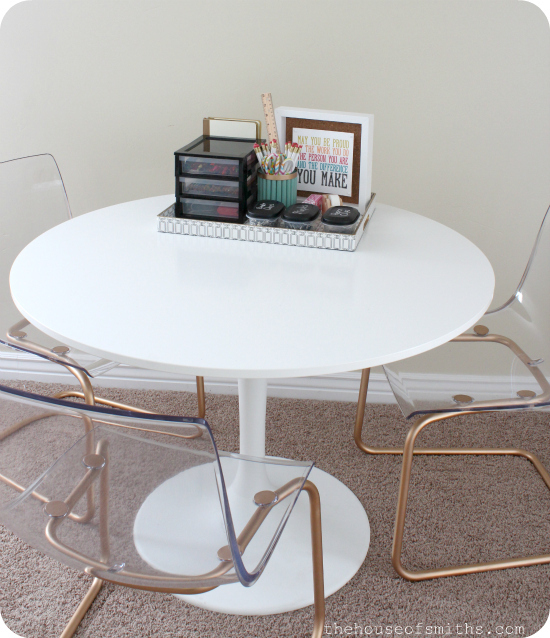 Now that everyone's back in school, do you have a homework "zone" for your kids? 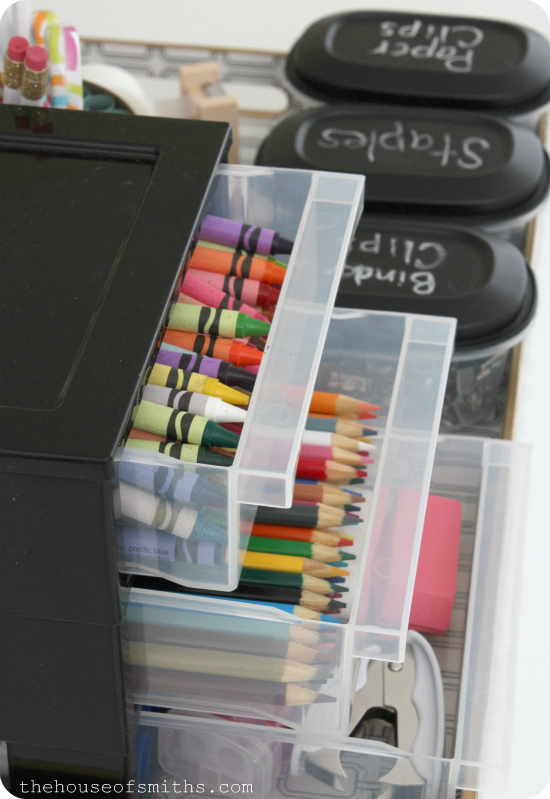 Have you thought about making one, big OR small to keep the homework mess contained? I wasn't alone on this challenge either. 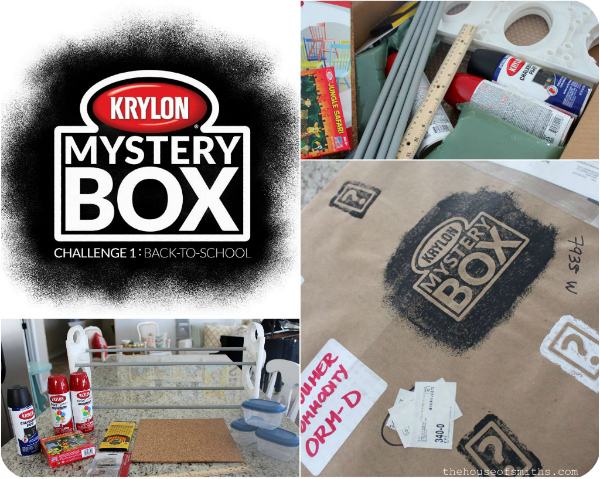 Becky from Infarrantly Creative and Gail from My Repurposed Life also took on the Krylon Mystery Box Challenge. Head on over to their sites to see the awesome projects they came up with, using these same materials! Krylon brand provided me with product and compensation for this post. Regardless, I only post about products or companies I love. All ideas and opinions are 100% my own. 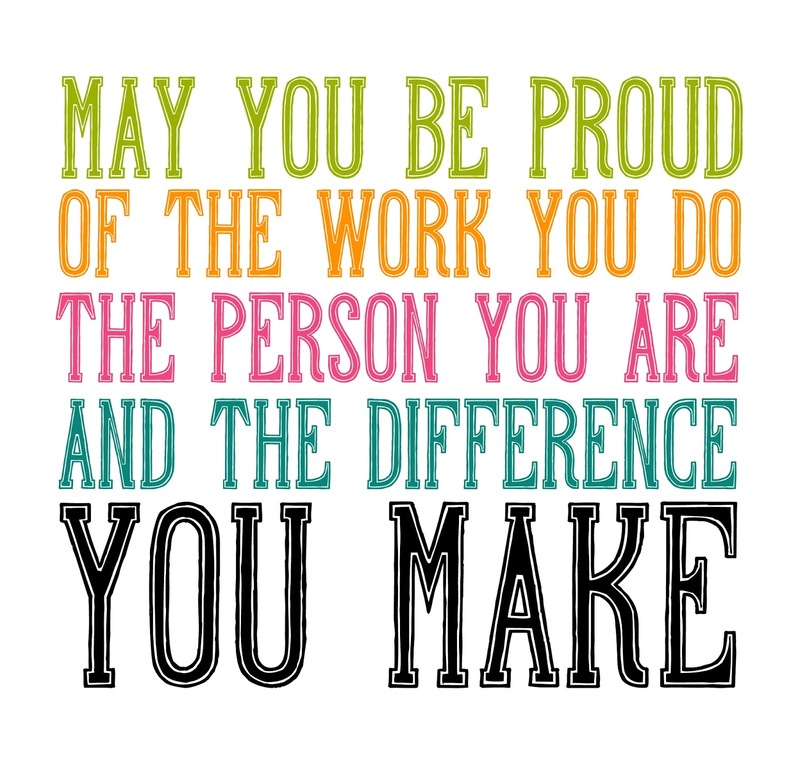 Just discovered your blog a few weeks ago -- LOVE this and am so inspired by your creativity. 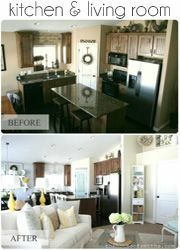 Now for just a few more hours in my day to tackle a few of these DIY projects! ;-) Thanks!! when I read that list, I thought workstation too! 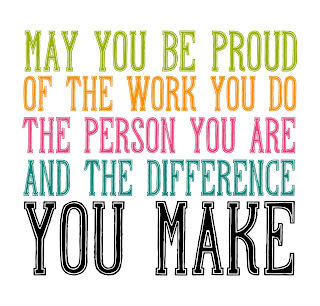 You did a great job making it pretty!! 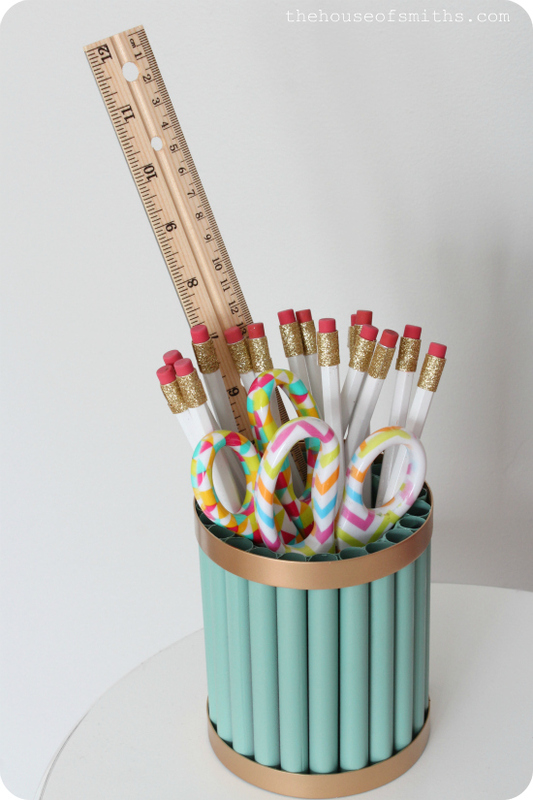 LOVE the shoe rack pencil holder! Looks AWESOME! Shelley, you are amazing and your inspirations rock. 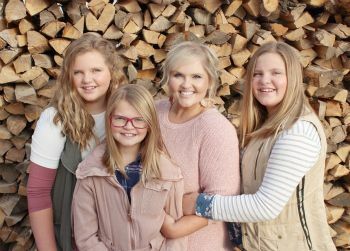 I enjoy your blog, family photos, piano music by Cason, and your darling daughters.I truly believe my six year old granddaughter would have a ball with them. Love the print! I'm reading this during my lunch break in my cubicle, and I immediately printed it out and hung it on my wall. Thanks. Very cute and functional! I love it. You've inspired me to do something like this for my girls. Can you tell me where you picked up those adorable scissors? Thanks! LOVE IT! I knew you could come up with something totally awesome. Like a rock star. XO! Um, you are amazing as usual. GREAT idea! I may need to make a homework station for our house this weekend! genioius!! I will now wait to see what you might do with the shoe rack ends :)) How fun and challenging to receive a "mystery box" to DIY in the mail ! 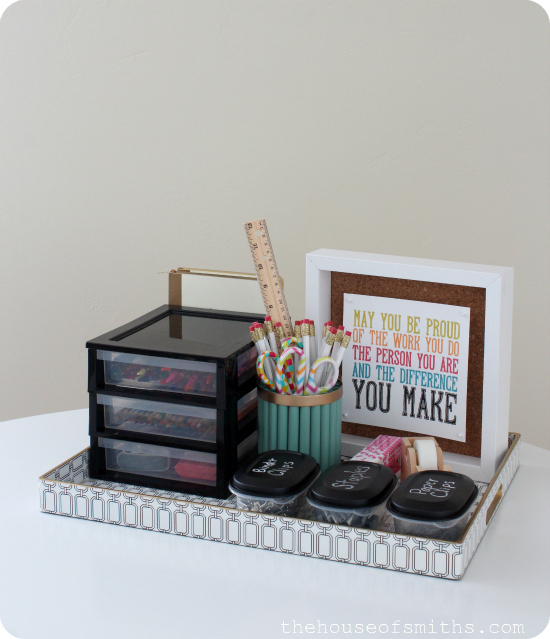 What a cute idea to organize homework necessities! I think half the battle of homework is getting the kids to sit down and focus. They usually waste time searching for a pencil, or other supplies before finally getting down to business. Now there will be no stalling necessary! Thanks for sharing!! That is such a cute idea! You little school makes me inspired to do some homework and I'm not even a student! We have an area in our sunroom that they each have a cubby for their backpacks on the bottom, the top shelf has wicker silverware baskets that I spray painted and hold all the belongings like pencils, colored pencils...., below that they each have a wire mesh basket with their own personal organizers of their own pencils, scissors......Now if only I had a place for them to bring it all to other than the kitchen table. As a mother of three, 2 in middle school and 1 in elementary, I cannot tell you how many years I've had a homework station. Mine is in an old Pottery Barn Kids wooden box which used to house legos [since outgrown]. 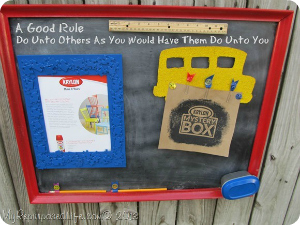 The box has a home in a cupboard and when homework begins, one of the kids gets the box and uses what he/she needs. What a timesaver having it all in one place. I also have another box just for poster projects and such. It houses fat poster markers, glue, letter templates, shout-outs, washi tape and other things necessary for those last minute poster projects. I am always sure to keep a small supply of cardboard and poster boards on hand too so no last minute runs to Walgreens. Krylon Mystery Boxes are my favorite in this post. These are really nice boxes for self storage needs. 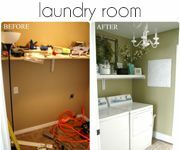 This is a systematic way of storing the items. I too use to store in the same way but, I also use to store my items in a storage unit. 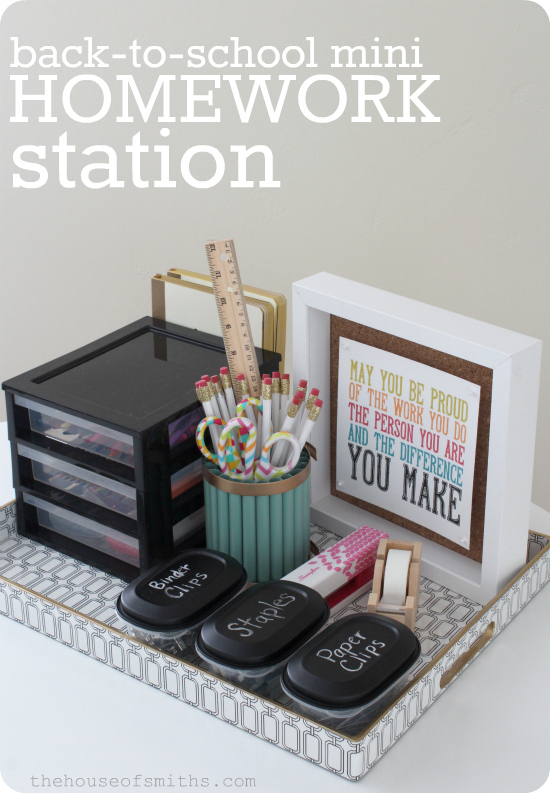 I LOVE this idea...Homework station...I think this could also be a great teacher desk (my daughter) gift...Motivation stickers, posted notes, note pads in drawer #1, tape, stapler, scissors, hole punch in drawer #2, and calculator, white board markers drawer #3! I made the frame, my picture is a bit smaller but I think it turned out well nonetheless. 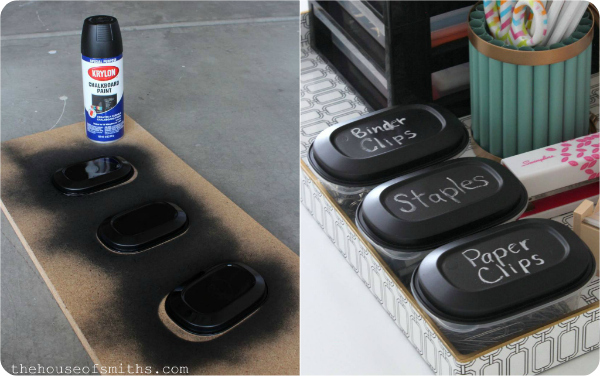 My next step is to spray paint my container lids with the chalkboard paint like you did so I can label them. Ty for the awesome ideas!